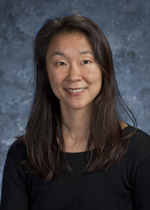 Maria Rhee is a graduate of Duke University with a bachelors of science degree and a Medical Degree from Tufts University School of Medicine. She did her training in obstetrics and gynecology at Yale-New Haven Hospital. She is board certified in obstetrics and gynecology and a fellow of the American College of Obstetrics and Gynecology. She has been living and practicing in the New Haven area since 1997. She has hospital privileges at Yale-New Haven Hospital and Temple Medical Center. She has an appointment as a clinical instructor in OB-GYN at Yale University School of Medicine. Dr. Rhee’s expertise as an obstetrician and gynecologist allows her to provide care to women of all ages. Her interests include cervical, uterine and ovarian disease screening, prevention, and treatment, noninvasive and minimally invasive care of abnormal uterine bleeding, DaVinci robotic minimally invasive surgery, family planning.